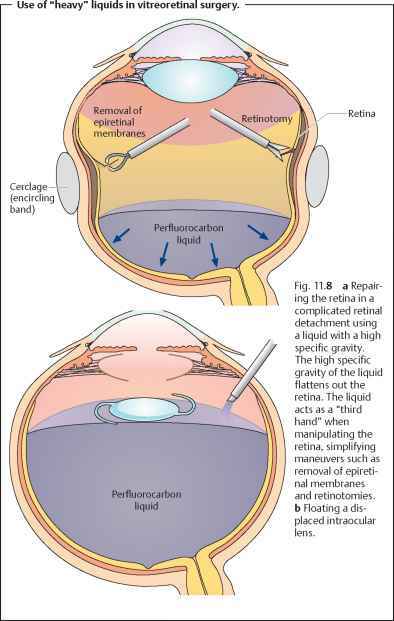 Surgical removal and replacement of the vitreous body with Ringer's solution, gas, or silicone oil. ❖ Removal of intravitreal displaced lenses or foreign bodies. ❖ Severe postoperative or post-traumatic inflammatory vitreous changes. Procedure: The vitreous body cannot simply be aspirated from the eye as the vitreoretinal attachments would also cause retinal detachment. The procedure requires successive, piecemeal cutting and aspiration with a vitrectome (a specialized cutting and aspirating instrument). Cutting and aspiration of the vitreous body is performed with the aid of simultaneous infusion to prevent the globe from collapsing. The surgical site is illuminated by a fiberoptic light source. 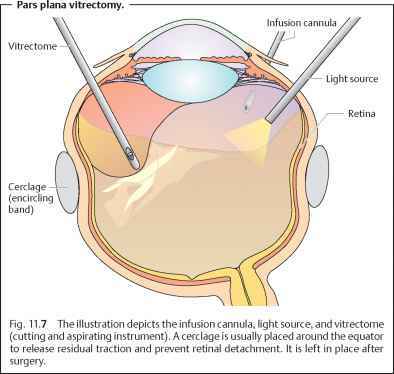 The three instruments (infusion cannula, light source, and vit-rectome), all 1 mm in diameter, are introduced into the globe through the pars plana, which is why the procedure is referred to as a pars plana vitrectomy (PPV). This site entails the least risk of iatrogenic retinal detachment (Fig. 11.7). The surgeon holds the vitrectome in one hand and the light source in the other. The procedure is performed under an operating microscope with special contact lenses placed on the corneal surface. Once the vitreous body and any vitreous membranes have been removed (Fig. 11.7), the retina can be treated intraoperatively with a laser (for example, to treat proliferative diabetic retinopathy or repair a retinal tear). In many cases, such as with an unabsorbed vitreous hemorrhage, it is sufficient to fill the eye with Ringer's solution following vitrectomy. Fig. 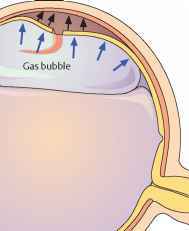 11.9 a An intraocular gas bubble exerts pressure primarily in the superior area (blue arrows) due to its buoyancy. This must be considered when positioning the patient postoperatively; the patient should be positioned so that the foramen lies in this region. b Completely filling the globe with silicone oil fixes the retina to its underlying tissue at practically every location (arrows). 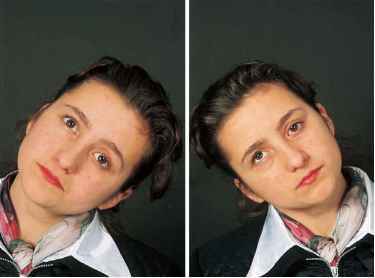 pose as it completely fills the vitreous chamber and exerts permanent pressure on the entire retina (Fig. 11.9b). 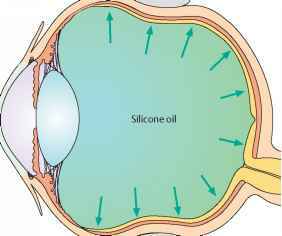 However, silicone oil inevitably causes cataract formation and occasionally corneal changes and glaucoma. Therefore, it must be removed in a second operation. Complications: Vitrectomy nearly always leads to subsequent lens opacifica-tion, and rarely to retinal tears, bleeding, or endophthalmitis.